A Great Noyse is Victoria's Renaissance Wind Band. Formed in 2007, this ensemble specializes in wind consort music from the 14th through the 17th Centuries. 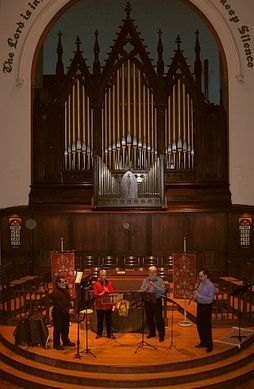 The four members have an impressive 30 instruments between them, all accurate reproductions of authentic instruments from the period, including recorders, crumhorns, shawms, sackbuts, smallpipes and others. The group is well-known for offering an additional element of theatricality, building their concerts around spoken narratives that vividly bring to life the historical context of the music.